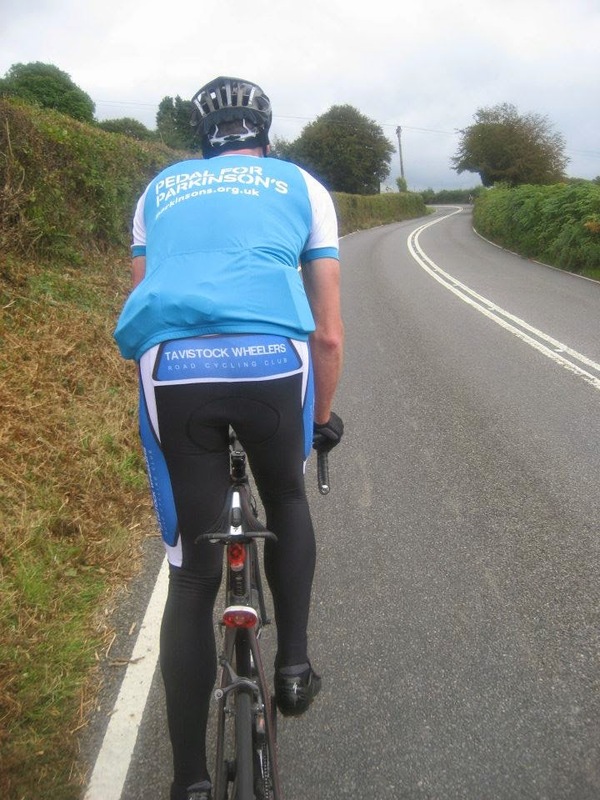 EverestingUK: Everesting in Devon - "Literally a mountain to climb"
Before I knew it, the weekend had arrived. I’d planned to finish in daylight but based on training sessions on the hill in the preceding weeks I’d worked out my intended 3am start wasn’t going to cut it. A new plan was drawn up with a 12.30am starting time. And so it was, not long after midnight I set off on the short drive up the other side of the valley to begin – would normally have cycled to the start but not possible with the quantity of quiche and pork pies I had in tow! My plan for the day, again based on feedback from others, was to have milestones – to never be too far away from the next ‘thing’ happening, whether that be a break or a friend popping along. And so it was I had a couple of breaks’ worth of food and drink in the car with my first ‘event’ to look forward to being daybreak. It all passed very quietly and uneventfully, the only traffic being in the first hour or so – mostly taxis, I assumed people returning home from far more sensible ventures to the pub. The morning itself was turning out to be perfect weather-wise so, feeling good myself, on and on I pressed. In those early dark hours when all I could hear was breath and pedalling, I remember feeling a great connection with other Everesters, people I haven’t met but who at some point have also experienced the same feelings of being alone, enjoying the solitude and sound of ‘just bike’ with literally a mountain to climb. We’d all been at that point and from the fellas in the UK I’d spoken to, to those as far as Australia and New Zealand who had sent advice and encouragement previously… I felt we were all connected and part of a common something. A good feeling. Daylight came and indeed a boost to turn the front light off and see a few more folk around. Not long after daylight a fellow rider and work colleague popped along for a few reps as part of his Strava September Gran Fondo. Again, a boost mentally and together we pressed through my 1/3 marker. 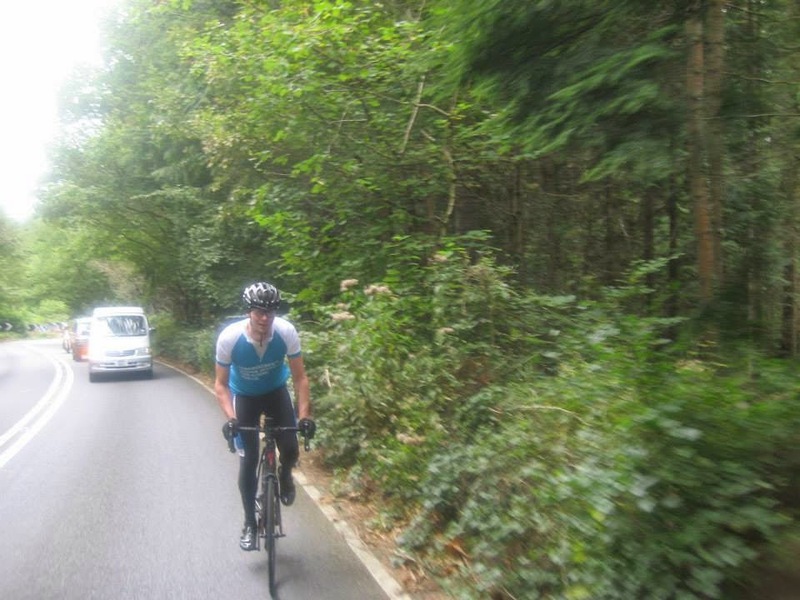 5 reps done together, chatting all the while so I didn’t much notice them passing, and Dean (Plymouth Corinthians CC) was on his way further into Cornwall. I’d conveniently forgotten to tell him the hill back out the other side of the valley on his route is much, much worse – he thanked me for that next day. 8am or so now, the next ‘thing’ being the arrival of the other half around 10am. This progressed on schedule, a very welcome hot and sweet coffee and the first of lots of quiche scoffed throughout the day. 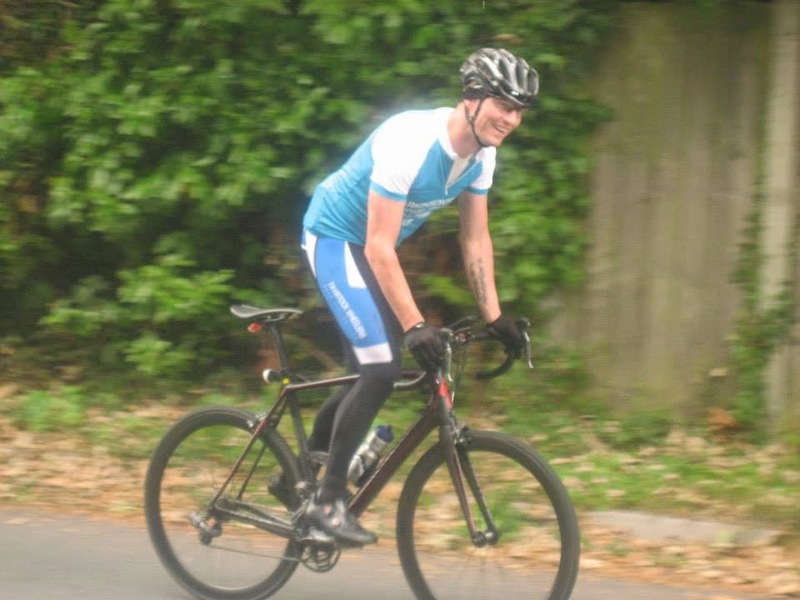 A change of jersey and away again…. The next thing on the schedule was another friend and colleague, Simon from Plymouth’s YOGI club, bringing the club’s Saturday ‘16’ run through. Great to see the guys, a fleeting visit but familiar faces and some words of encouragement keeping morale on the good side. Simon mentioned he was coming back later in the day following the club ride, around roughly when I should be finishing, so another positive marker in the calendar. Because, around about 3pm it all went a tad wrong. I’ll preface that with some info though – when I plan something, especially involving any ‘tech’, I tend to research the hell out of it and have various back-up plans. So, my own Edge 800 was backed up by a 500. The 800 had a PowerMonkey on hand. In the weeks leading up to the event I’d tested the PowerMonkey every which way, no issues at all. I’d also heard that the 800 could get its pants in a twist with a long ride over 18 hours or so….so, the 800 and PowerMonkey came with me on a couple of business trips, recording all the while and all performed as I’d hope. No worries there then eh! Somewhere earlier in the afternoon, not sure when exactly, the 500 died. Low battery. Ah well, I figured, the 800 is showing good power (had been PowerMonkey-ing it during breaks) and I’ve had no issues with it in the couple of years I owned it. Upon noticing the 500 died I checked the 800 and saw something just over 7000m of climbing done – good stuff, I thought, the end is appearing in site. Next time I looked at the 800, the aforementioned 3pm going wrong o’clock….. it was off. OFF! Last time I had an 800 simply drop out like that (due to battery previously, from memory) the ride data was lost. But it couldn’t have been the battery, it was at 50% at the very least. So, with heart in underpants, we stopped and pondered. As we pondered Simon returned, initially all smiles before quickly getting the vibe that all was not well. I tried turning the 800 back on several times and on one go the ride screen displayed briefly before it powered off, I could see the 7300m done – so there was hope the data was in there somewhere. We’d a brief break while my other half took the 800 home to try on mains power, she reported shortly after that no joy, same symptoms. My thoughts turned to a poor fellow-Everester who lost his data 2/3 of the way in, over 20k feet of climbing done. He packed up and headed home and for a couple of minutes this was my plan too. But, the 3 of us at the time knew over 7300m had been done and regardless of whether I’d eventually be able to prove it the fellas spurred me on to finish it off. Not the right way of thinking at all, but I’d have been disappointed to finish it and not prove it (what about my kudos man!!??) – but it’s about the accomplishment itself, right? After a natter, a Snickers and more quiche, Glyn reset his 810 and let me borrow it to record what was left to do. Simon stayed for a few reps before being rescued by his good lady…. Glyn stayed on to do more than his fair share of reps for the day and around 5pm we stopped atop the hill with just 5 to go before Glyn set off homeward, leaving me with his 810. My folks had stopped along to say hi at that point, brought the kids too, more good stuff on the morale front. Then I set off back downward…..5 to go….1 hour of climbing….. in a somewhat gloomy and determined mood with the Garmin still playing on my mind. With 3 to go Martin from the club appeared once again, alongside my wife who’d been there for the last 10 or so reps. With 2 to go it wasn’t a chore any longer…. ‘1 more time up this hill and I only have to do it 1 more time!’ The final descent…. before the day I figured I might stop at the bottom of the final ascent and get emotional or something. On the day it was a quick turnaround, a look around and a slight smile, then powered by the prospect of actual finish line being at the top of this rep off I went one last time. Done! Finish line crossed!! 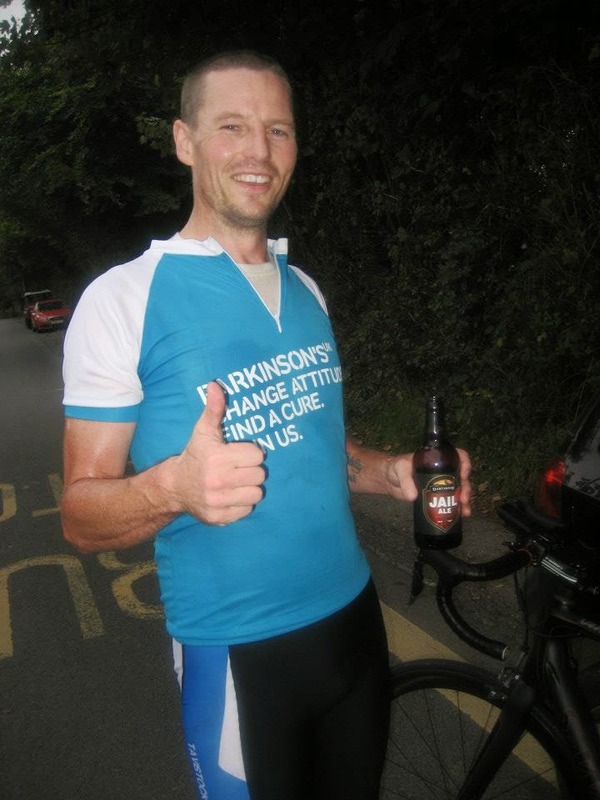 A quick chat, some pics with Martin before he headed onward and myself and Claire sat by the car and cracked open an ale! A tasty, tasty ale!! It was done, I had Everested and at that moment, oddly for me now I think about it, I’d completely forgotten about the Garmin issue. 6.30pm-ish, evening drawing in, long day (17.5 hours) cycling….time to go home for a shower and a chill, right? No, this is Devon – off down Calstock way for a couple of ciders! Still in cycling gear, albeit with whatever fresh and unworn gear I had remaining, and probably smelling none too pleasant at all. A Thatcher’s never tasted so good! · Ensure those milestones. Knowing something ‘good’ is not too far in the future helps loads. It’d be interesting to do it on a longer and/or steeper hill, requiring less reps (think I did 66 overall). Let’s see what next year brings…..
I’ll finish with a few thanks…. 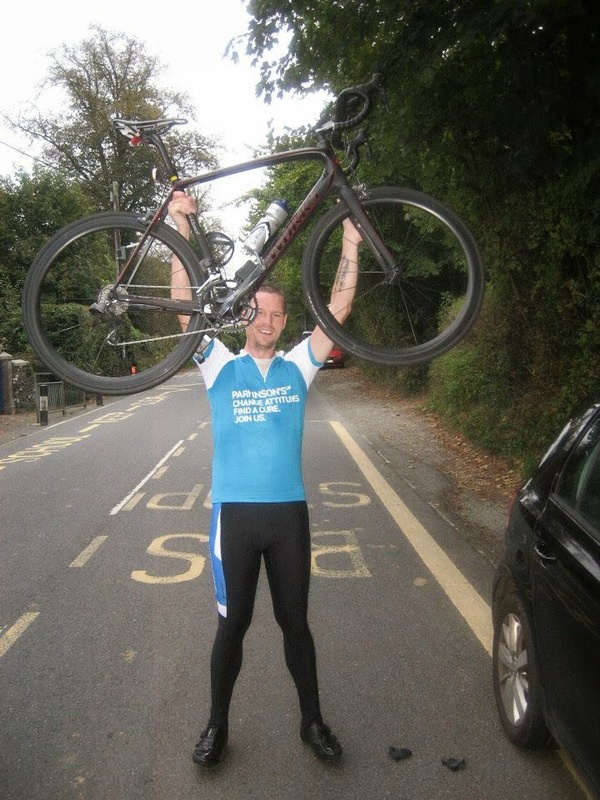 to Dean, Simon and Glyn for joining on the day…. to Martin for a few reps and taking the pics….. to Claire for the company and helping keep the calorie intake at what would surely otherwise be a lethal rate…. to Dartmoor Brewery for the Jail Ale (my favourite!)….. and one last time to Glyn for the Garmin. Mainly I think Mountain Bike skills , tips, techniques and maintanance resource for riders of all abilities. Improve your MTB skills and riding ability over varied terrain including . It's great tips to grow our mountain bike skill. We should increase our cycling skill before participate any cycling competition, on the beside you should need top quality mountain bike to get success. Here is our excellent guide which is written by our expert riders after read it i think you will be benefited. Apart from this they also tend to learn a lot about the basic rope climbing techniques,how you can help which are applicable in mountaineering ventures.